Controversy sprung up earlier this week when it was revealed that Mark Wahlberg was paid $1.5 million for 10 days of reshoots on All the Money in the World, while Michelle Williams, who was nominated for a Golden Globe for her performance in the movie, was only paid $800. The report came just days after the Time's Up movement had a triumphant evening at the Golden Globes in an effort to finally level the playing field in Hollywood for women. Actresses in the entertainment industry were appalled to see that Michelle Williams had made less than 1 percent of what Mark Wahlberg had made in the 10 days of reshoots. A new report from USA Today has revealed that Mark Wahlberg had co-star approval in his contract for his role in All of the Money in the World, which he used when Kevin Spacey was let go from the project after multiple allegations of sexual misconduct. 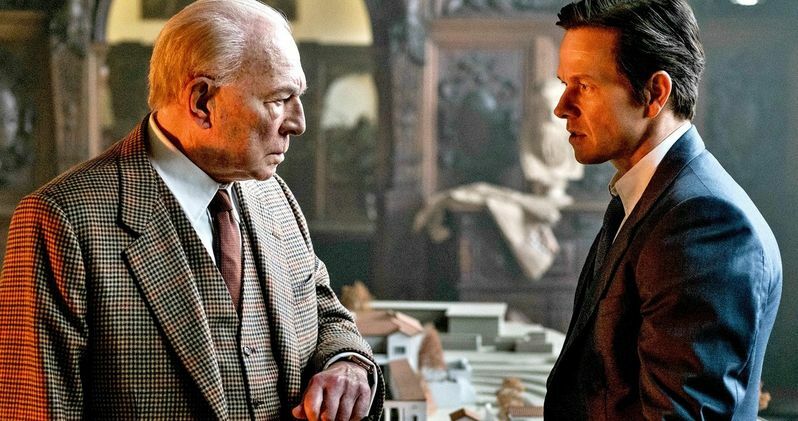 The report goes on to say that Wahlberg refused to okay Christopher Plummer replacing Spacey until he was paid over $1 million to do the reshoots over the Thanksgiving holiday. Sources close to the project reveal that the actor was adamant about getting paid in order to make the reshoots happen. The source said, "What he said was, 'I will not approve Christopher Plummer unless you pay me.' And that's how he (expletive) them." All the Money World director Ridley Scott originally claimed that all of the cast and crew came back to do the reshoots for free, which has now been proven to be false. It was initially reported that Mark Wahlberg did not have reshoots in his contract, which led to a negotiation and a quick payday for the actor, while Michelle Williams had reshoots in her contract. However, this too is false according to the sources that spoke to USA Today. The source claims that both actors had reshoots in their contracts and both actors were paid for the same amount of days in Europe. Ridley Scott's kidnapping drama was quickly reshot the week of Thanksgiving after a multiple sexual misconduct allegations were made public against Kevin Spacey, who had starred in the drama as billionaire J. Paul Getty. Christopher Plummer was brought in to replace all of Spacey's scenes and has gotten rave reviews for his performance. Michelle Williams even earned a Golden Globe nomination for her performance in the movie, while Mark Wahlberg was not noticed for his work on All the Money in the World, which seems to be an apt title for Wahlberg. Mark Wahlberg and Michelle Williams are both represented by the William Morris Endeavor group and nobody involved in the story has responded to requests to speak out about the matter. Actors pay a team of agents, managers, and lawyers an average of 10% (and often times more) of their salaries to advocate for them and get them the best deals that they possibly can. It's been rumored that Michelle Williams did not even know of Wahlberg's negotiations until they were made public, which could make for an uncomfortable meeting with her manager the next time they get together. You can read more about Mark Wahlberg's reshoot demands via USA Today.